Smoky Mountain seclusion at its best. Tame your tensions relaxing in the bubbling hot tub. Enjoy a game of pool with your favorite people. Fresh mountain air will revitalize you. There's a dreamer in all of us. Come live the dream at Dreamer's Ridge. 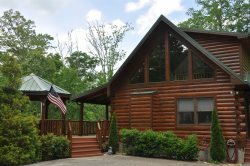 Hidden amid wild woods on a private hillside, Dreamers Ridge is a well-equipped cabin. It's so packed with amenities that you may not want to leave. Spectacular sunset views and fresh mountain air fulfill your smoky mountain wishes. 3 Bedrooms + 3.5 Baths. The upstairs bedroom has two Queen beds. The main floor bedroom has a King Bed. The lower level bedroom has a twin, and a King, which can be converted into two twins. There are three and a half baths. Amber wood spans across the vaulted ceiling giving a cheery glow to this mountain cabin. The loft sitting area is just right for reading a book. Stainless steel appliances glisten in the well-stocked kitchen. Cooking will be a breeze. Rare or Well done? Fire up the gas grill and then savor your steaks. Plan your next mountain adventure at Dreamer's Ridge. For guest reviews, please click on the review tab. Great communication and responses before and during our stay. The house was beautiful with a wonderful view. The main areas are very modern and were perfect for our group of 6. The Cabin is awesome. The mountain views from the cabin are beautiful. We had a great stay. Kids enjoyed all the games. We all enjoyed the cabin so much. Great place and location, host decorated the house well, pretty welcoming. Great cabin and view. We sat out every evening and enjoyed the view. The cabin is incredible and the view is wonderful. Thank you for the great stay and we will defiantly be back. I don't recall who I was in contact with, but they helped me find a suitable place to accommodate our large group and what we were looking for. My family enjoyed spending spring break at Dreamer's Ridge. Everything we could ever need was already here. We spent our days exploring for waterfalls and the evenings having very competitive pool tournaments. However my favorite part of the trip was being able to drink coffee in the mornings while looking out at the amazing views. We will be planning a return trip again soon. What an awesome trip! We had a great time. We brought our 2 daughters and there husbands and the 4 grandchildren here for the Polar Express. We saw huge icicles on the Blue Ridge Parkway, played in the snow at Maggie Valley and even saw snow flurries at the cabin. All very exciting for Floridians. Cabin was perfect and well stocked. Thank you for the Christmas Decorations. We loved our cabin weekend! We feel like this is our second home and look forward to coming back for our third year in this cabin next year. Thank you for a wonderful welcoming feeling and stunning views. Thank you so much! Had a wonderful time. This was such and amazing trip. THe sunsets are amazing and the beds are outstanding. We really enjoyed each other as this was a needed vacation. Thanks again and can't wait to come back. Cabin was awesome. We wished we could have stayed longer. The surroundings were wonderful completely surrounded by mountains. We really loved it. Had a wonderful time while here. What a beautiful cabin. See you again next year. All communication was done by phone or computer. Team was helpful and knowledgeable. WE had a wonderful stay! The cabin is amazing loved all the amenities. Thank you for sharing this wonderful cabin with us. Made some great memories and was unable to unwind!